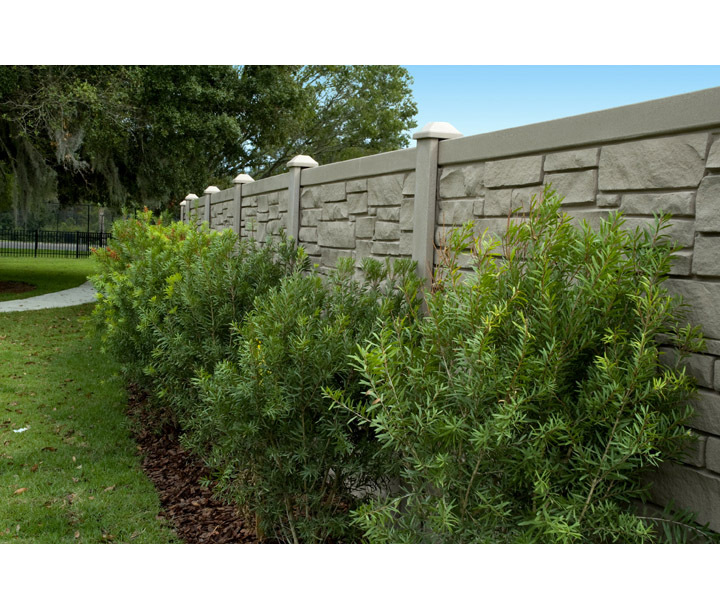 The SimTek EcoStone simulated stone fence has one full length panel with steel reinforced rails built into the panel. This style provides total privacy. Available in 3', 4', 6', and 8' heights. The 8' height features two stacked 4' panels. Gates are not available for the 3' height fence. 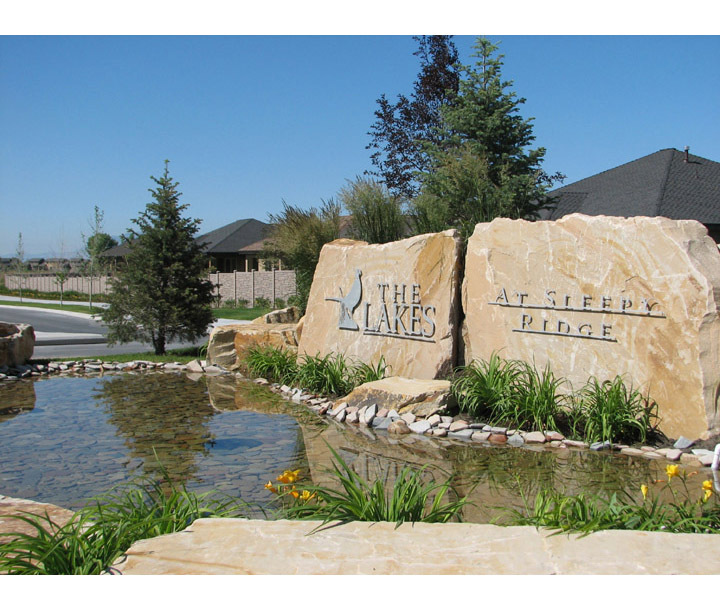 Authentic looking stone or rock surface adds to the attractive appearance. Sections can not be raked, stepping is the technique used to follow grades. Matching posts and post caps sold separately. 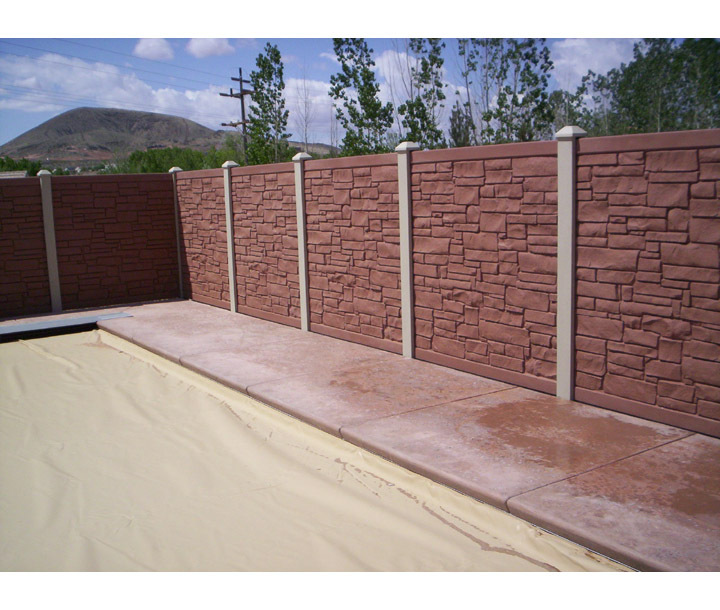 Colors have a granite textured finish and are available in black, desert, brown, gray, and beige. 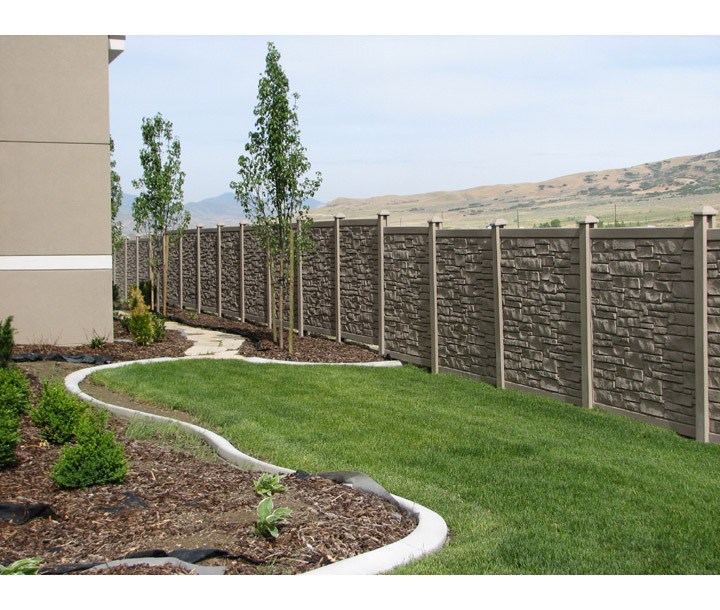 EcoStone™ Fence Panels are made of recycled polyethylene skin materials. This environmentally friendly product comes with a Manufacturer's 25 year Warranty! 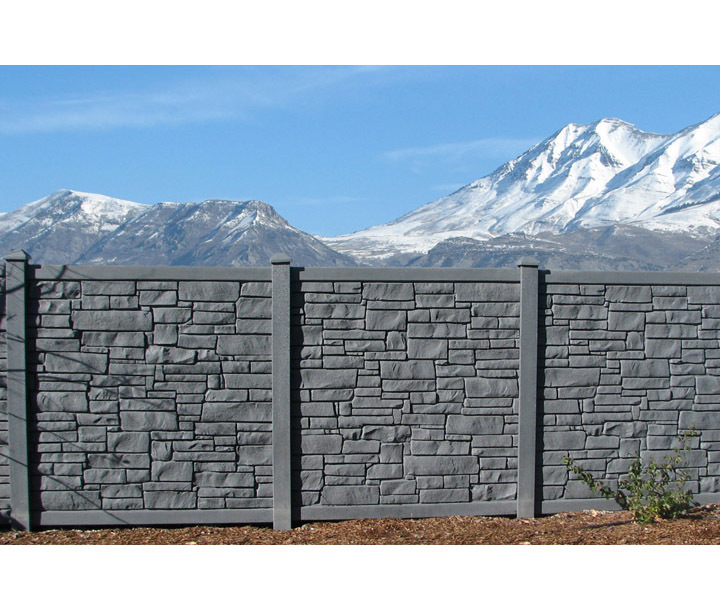 SimTek EcoStone & EcoStone Plus Fence has reinvented fence manufacturing with its patented design of rotationally-molded fencing allowing realistic stone appearance and superior performance. 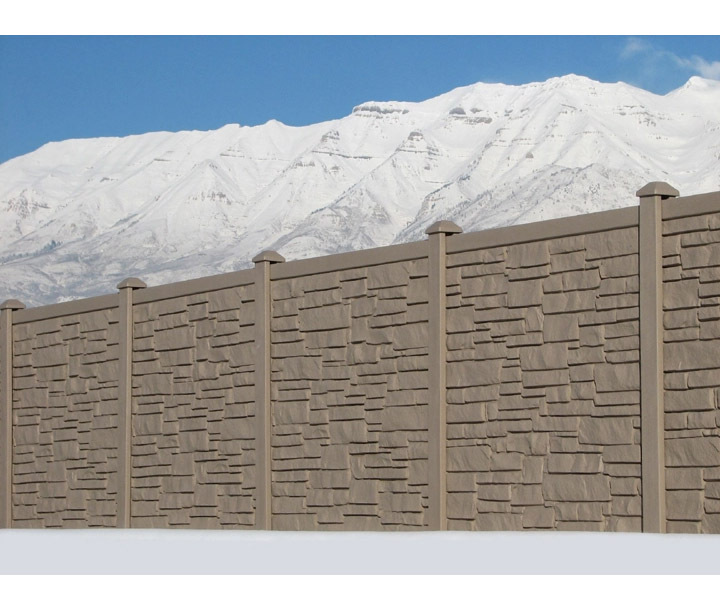 What makes SimTek Fence unique? Made with proprietary Linear Low Density Polyethylene Plastic (LLDPE) and is reinforced with galvanized steel. Can withstand constant hurricane force winds up to 110 mph and 130 mph gusts. Certified to Dade County, Florida hurricane requirements. For more information, click here. Blocks 98% of direct sound with sound transmission class (STC) rating of 26. For more information, click here. Very stable in temperature extremes. Withstands tests at -40° to 140° F.
SimTek carries six designer granite colors: Brown, Beige, Grey, Black, and Desert. 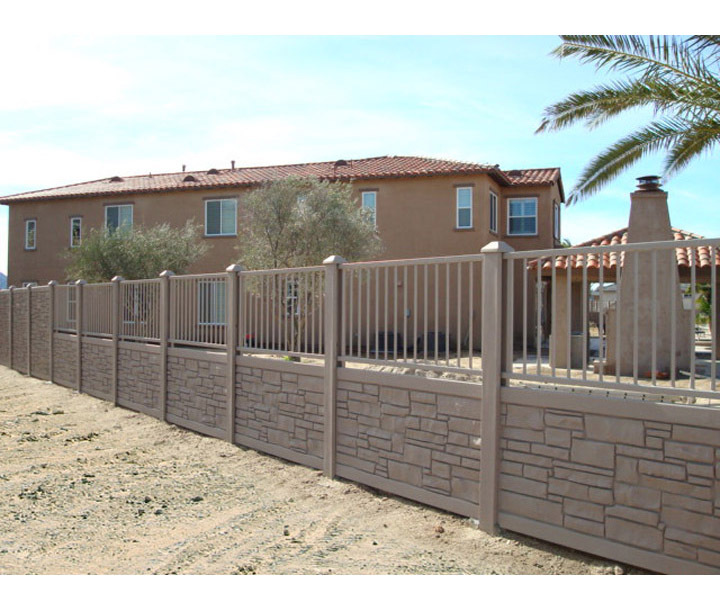 The most user-friendly fence on the market. We care about our environment. 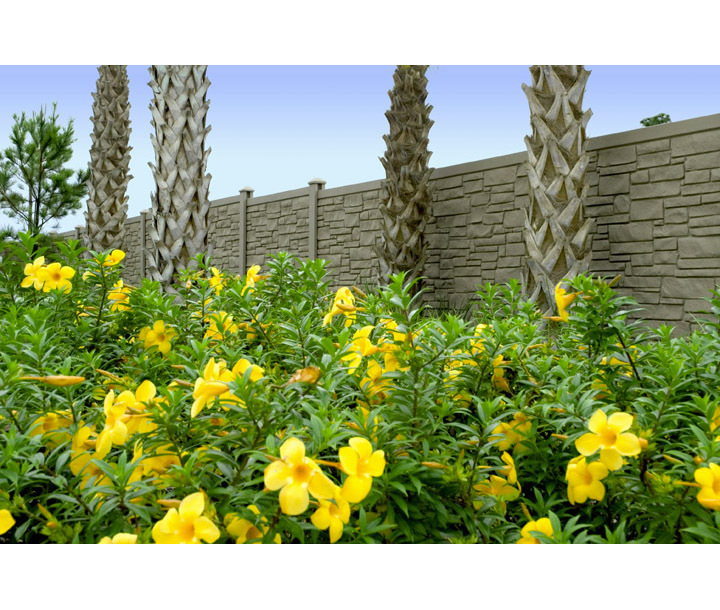 The SimTek EcoStone Fence panel is made with recycled and recyclable polyethylene plastic. The SimTek EcoStone Plus panels are made of virgin polyethylene plastic and does not use recycled materials. A maintenance-free solution. 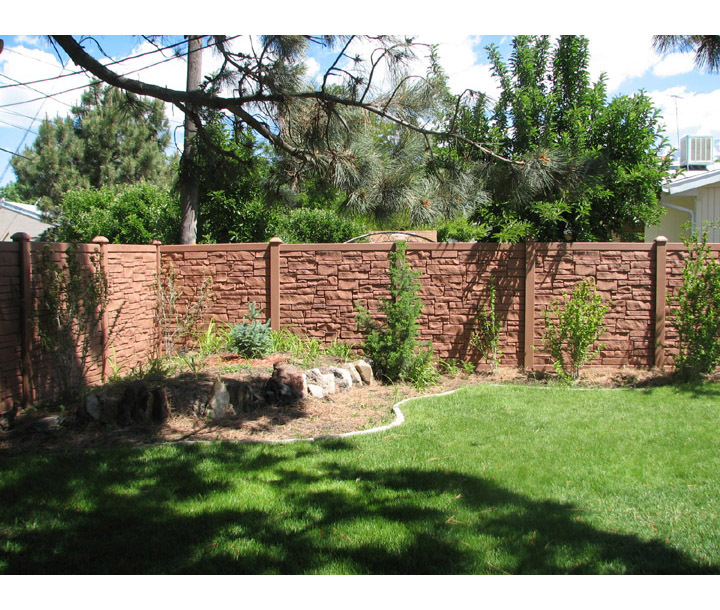 Our patented fence will never need painting or staining; nor will it warp, fade or crack. 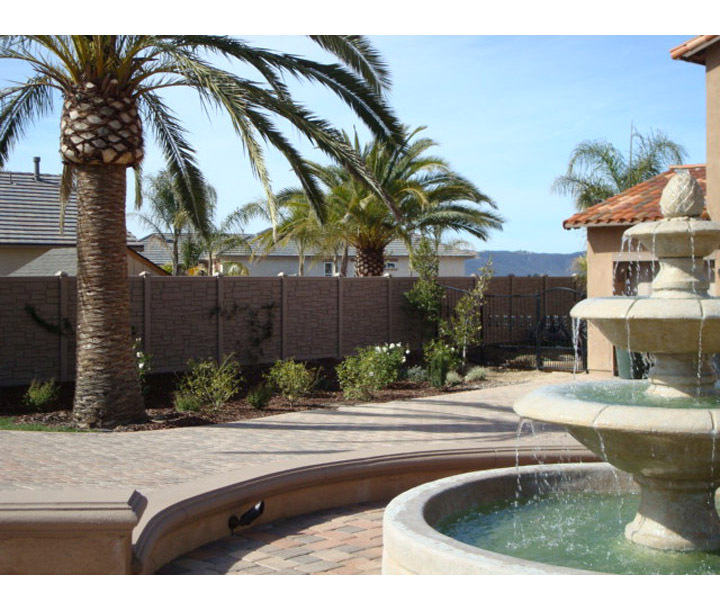 The EcoStone Plus product is warranted for a lifetime to be free from manufacturing defects. 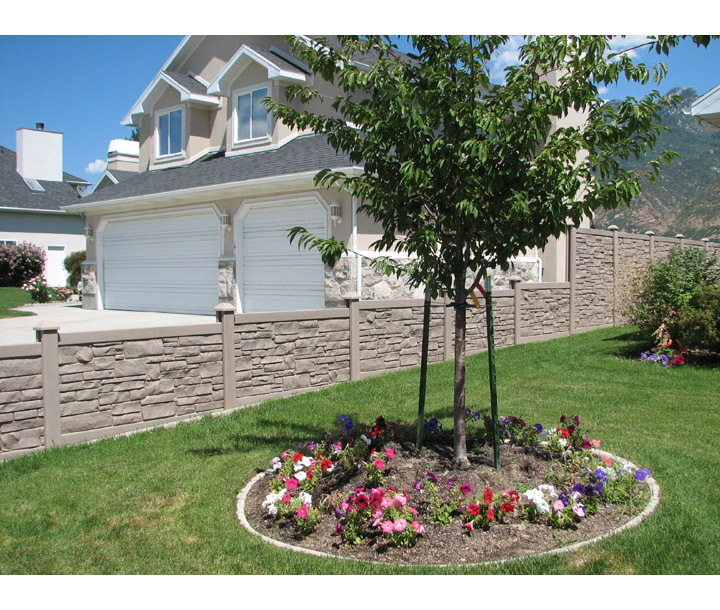 The EcoStone product is warranted for 25 years. 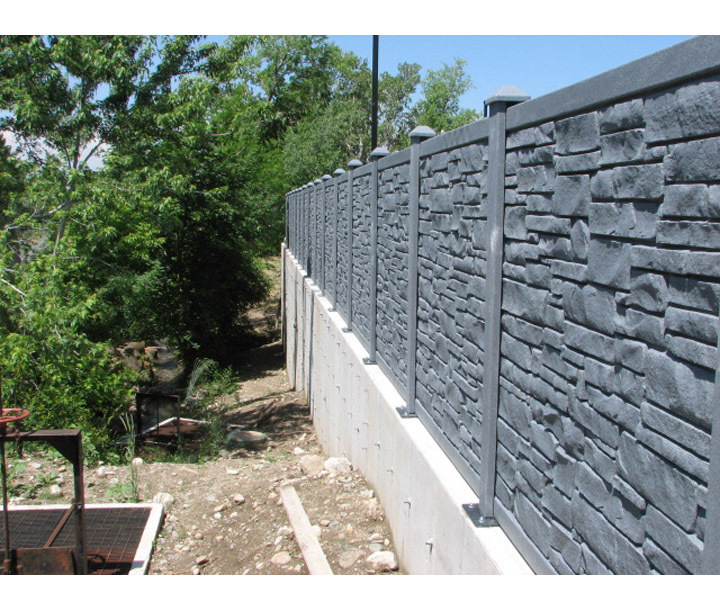 Enhance your surroundings with our revolutionary "rock-look" SimTek fencing. 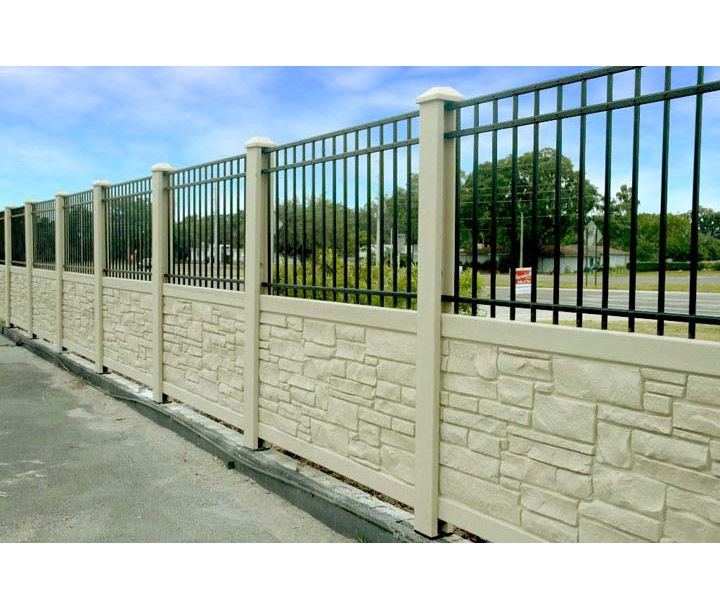 SimTek Fence warrants the EcoStone™ product line to be free from manufacturing defects in materials and workmanship for 25 years, or for as long as the original end-users owns and occupies the real estate on which the product was first installed. The manufacturer warranty does not apply to installation. 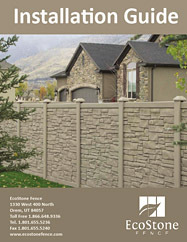 In the case of ownership by a non-living entity such as a corporation, SimTek Fence warrants the EcoStone™ product line to be free from manufacturing defects in materials and workmanship for 25 years, or for as long as the original purchasing entity owns the real estate on which the product was first installed. 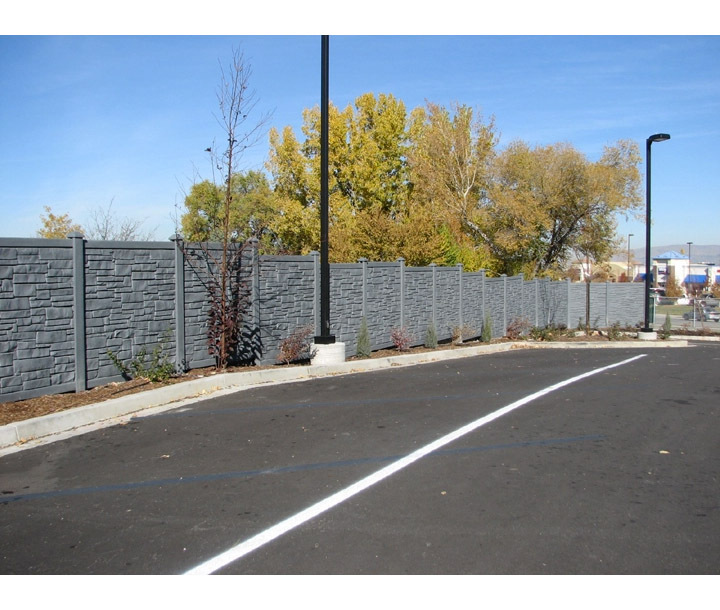 When proper installation procedures are followed and under normal and proper use, SimTek Fence will not crack, warp, peel, rot, blister, fade or drastically change colors. 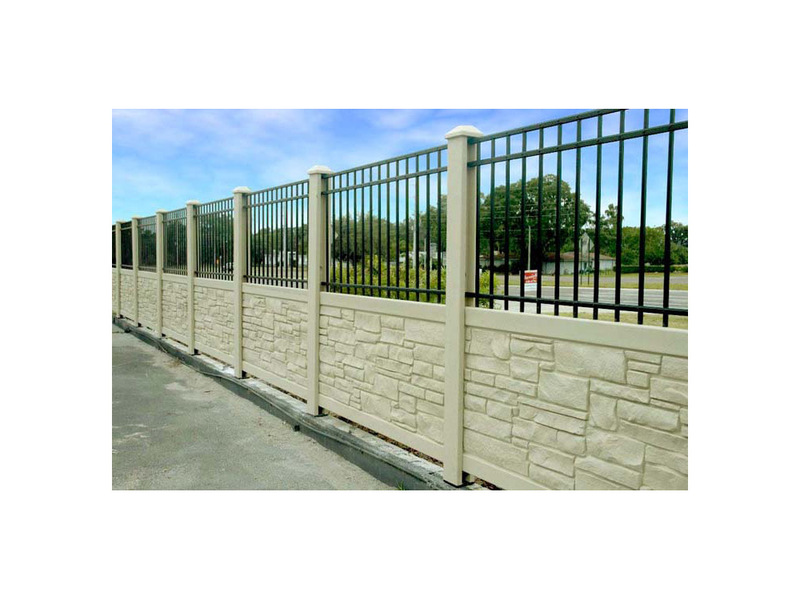 If such defects or degradation is discovered, SimTek at its sole discretion will repair, replace the product, or provide the customer a credit for the value of the product subject to the warranty with a reasonable time following the receipt by SimTek Fence of such of defect. This warranty does not cover damages as a result of abuse, misuse, vandalism, unauthorized repairs or modifications, defacement, neglect, accidents, improper installations, or improper use, acts of God, ground settlement, failure of any structure or soil in which the fence was installed, exposure to extremely harmful chemicals, fire, etc. SimTek will not be responsible for labor or other expenses not directly incurred by SimTek in effecting any claims under this warranty. SimTek reserves the right to modify, enhance, discontinue its products, including colors and will not be responsible in the event of replacement products vary in granite colors compared to the original product as a result of reasonable weathering and/or product engineering. In order to receive full benefits on this warranty, the end-use purchaser and titled property owner must register the product within 90 days of purchase/payment by completely and accurately filling out our online warranty registration at our website. Where can I find information about SimTek? SimTeks' website www.simtekfence.com is an excellent source of information. 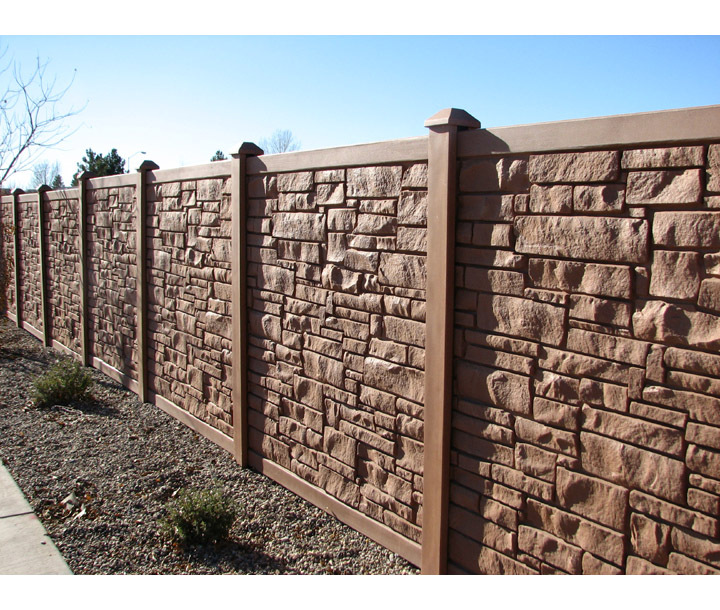 SimTek also has literature, fence and color samples and specifications available. For literature, samples, or specifications please call the factory at 1-866-648-9336. 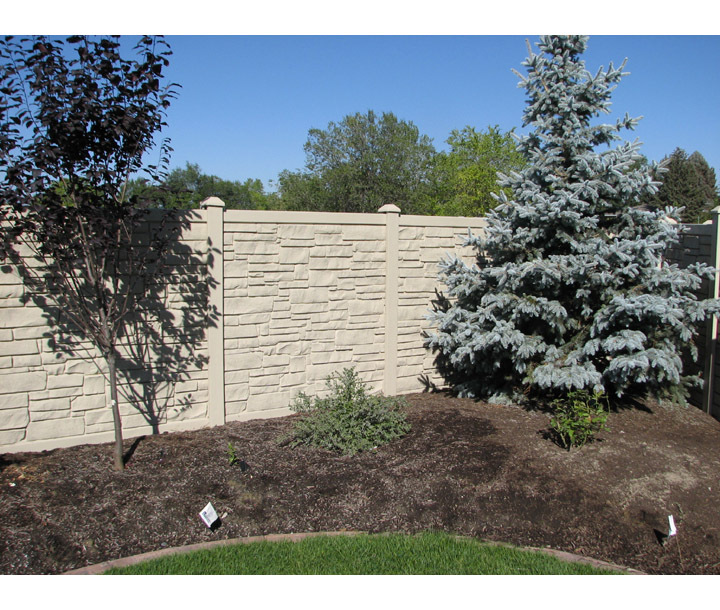 What is a SimTek Decorative Rock Wall? 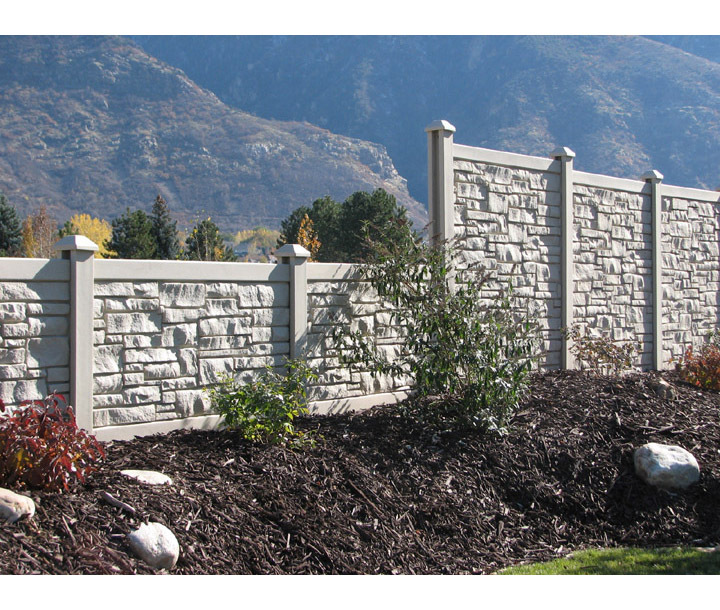 SimTek is a revolutionary new product, featuring stunning beauty and incredible durability. It installs like a fence. Several years of research and development resulted in a product with engineered excellence that is unique in the market place. The product is available in two forms; EcoStone and EcoStone Plus. They both use the same posts, caps, and gates made with virgin polyethylene skin materials. 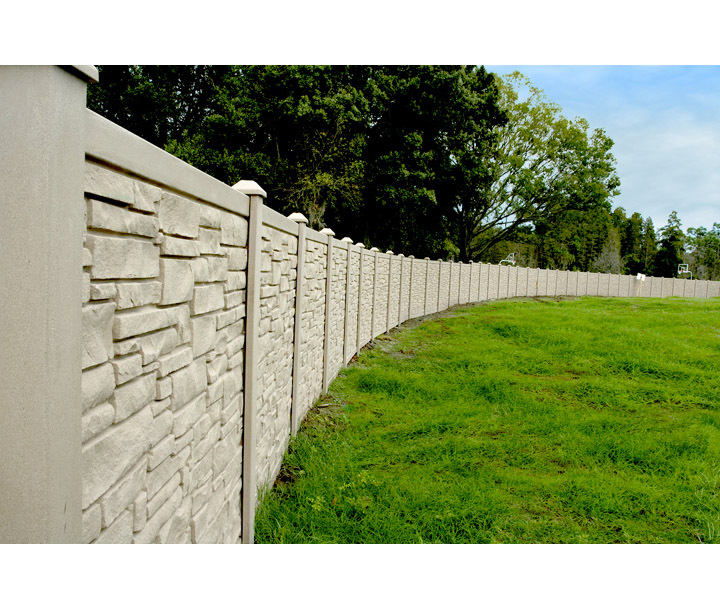 The EcoStone uses recycled vinyl for it's fence panels where the EcoStone Plus uses virgin vinyl for all it's components. Tell me about SimTek as a company. SimTek is headquartered in Orem, Utah where general offices and manufacturing facilities are located. 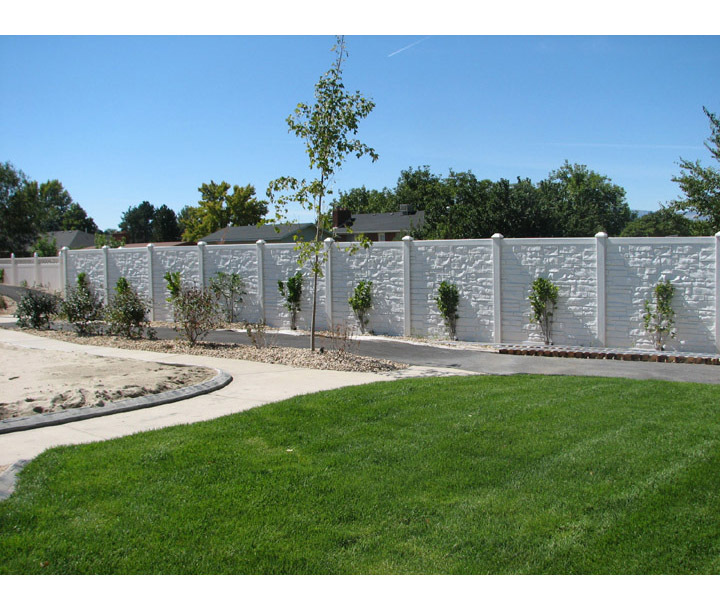 Research began in 2002 with several technological breakthroughs leading to the design, manufacture and market introduction in 2005 of SimTek Decorative Rock Walls. 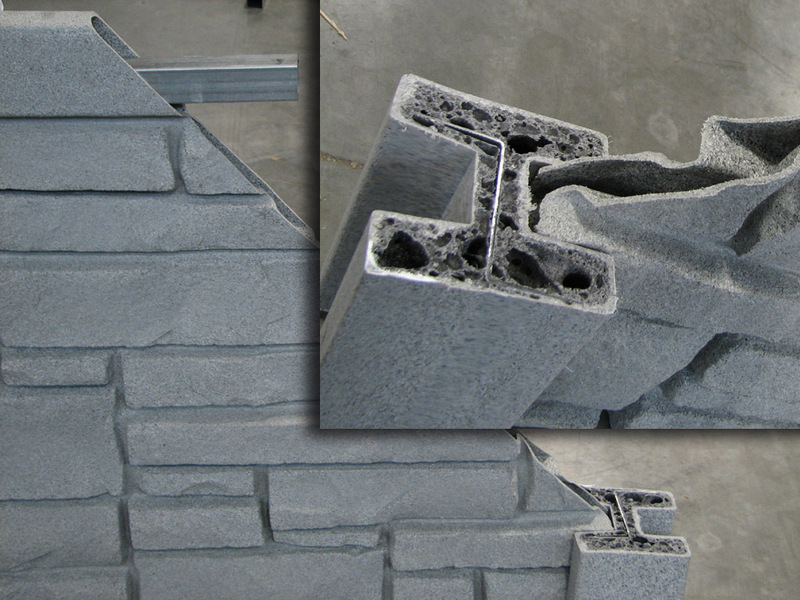 What material is SimTek Walls made of? 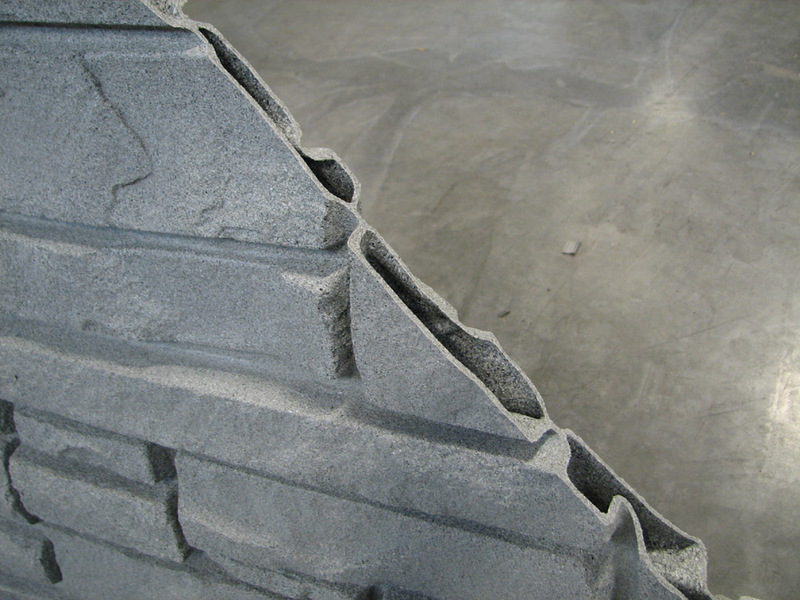 SimTek products are molded of sunlight stabilized polyethylene. All reinforcing steel is galvanized. Polyethylene provides exceptional durability, longevity and resilience. Gasoline and other corrosives are routinely stored in polyethylene containers. SimTek walls are resistant to organic processes, ultraviolet light, almost all chemicals and other common conditions that break down other walls and products. In short, polyethylene is tough, it lasts. SimTek is available in six beautiful designer "granite-effect" colors. 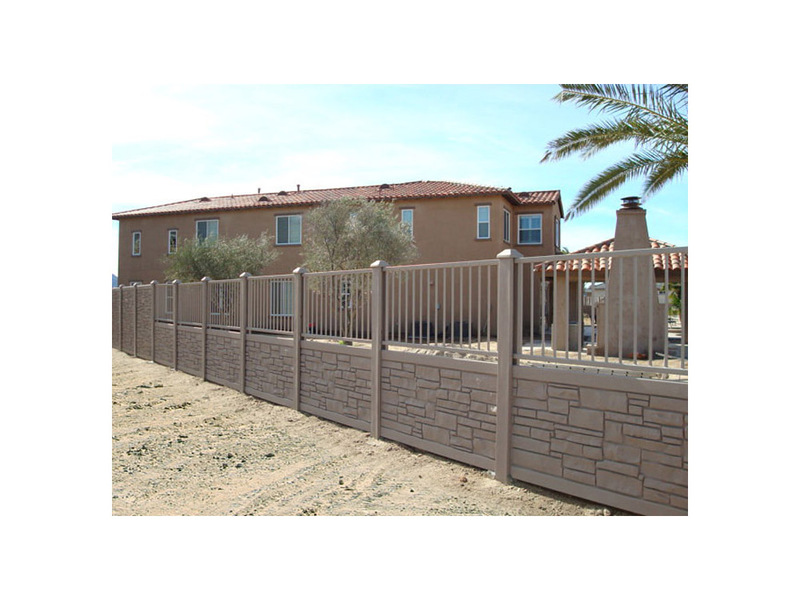 All posts, panels, caps, gates and other accessories are available in all six matching colors. Colors are: Brown granite, Beige granite, Grey granite, Black granite, and Desert granite. 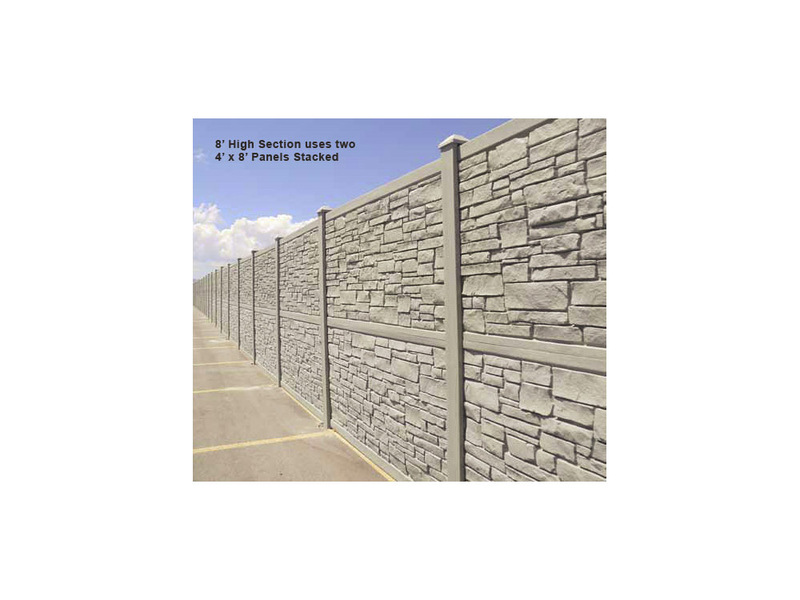 SimTek currently comes in 3', 4' and 6' high panels. 4' high panels can be stacked to make a 8' high fence. Posts come in two sizes, 102" and 142", but may be cut for different height configurations. Can I transition between panel sizes? Yes, Simtek offers a Gap Filler that is designed to fit in the groove above a 3' panel when transitioning from a 6' to 3' panel. 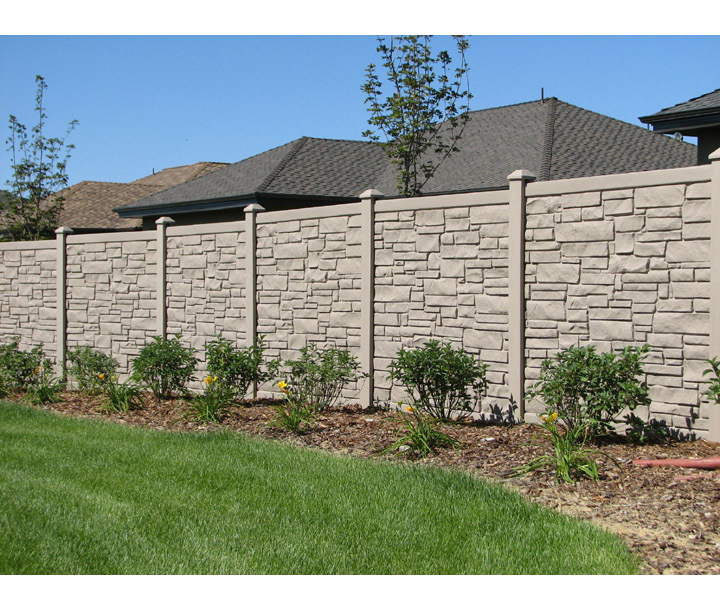 Gap Fillers are available in all 6' colors to match the color of your fence. 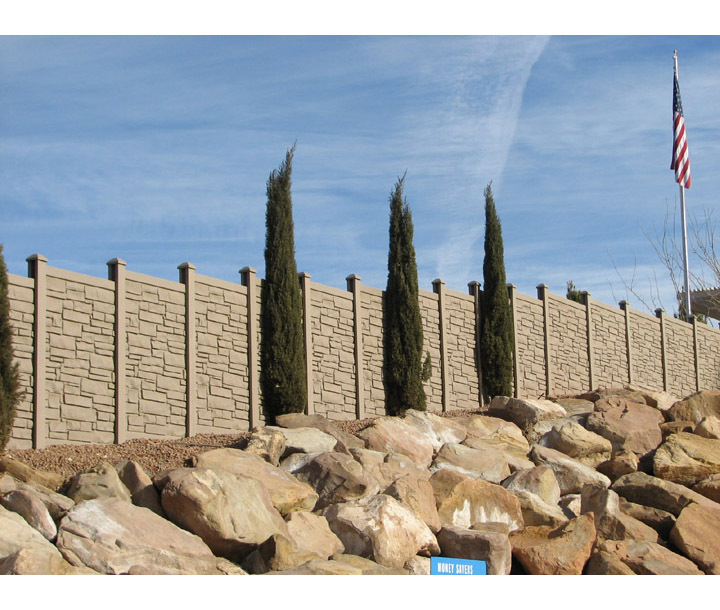 Gap Fillers are not necessary, as most customers don't object to the appearance of the grooved post. They are available for people who desire the "finished" look. Unaffected by water, most common chemicals, salt spray and algae. Resistant to impact. Baseballs, golf balls, rocks and other such items bounce off. 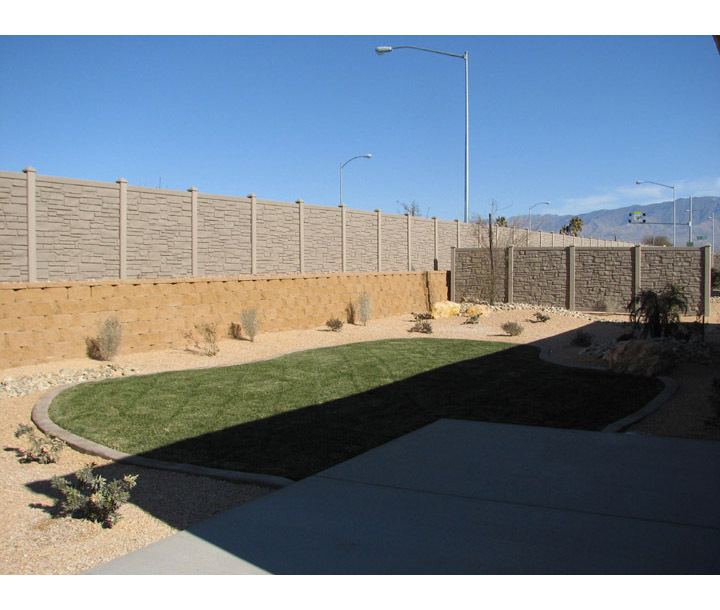 Performs well in hot and cold climates, bright sunlight and heavy moisture. 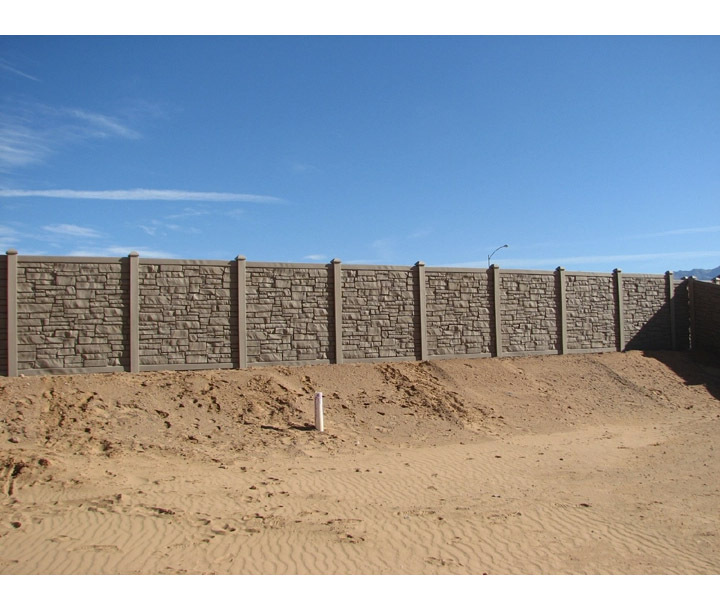 SimTek Walls will withstand 110 mph sustained winds and 130 mph gusts. Does heavy sunlight, resulting heat and ultraviolet rays affect SimTek? SimTek is engineered to withstand temperatures ranging from -40° to +140° F. SimTek is very fade resistant, containing UV-12 inhibitors to combat ultraviolet rays from the sun. Most other resin based products contain up to UV-8 inhibitors. Does a SimTek Wall block sound? 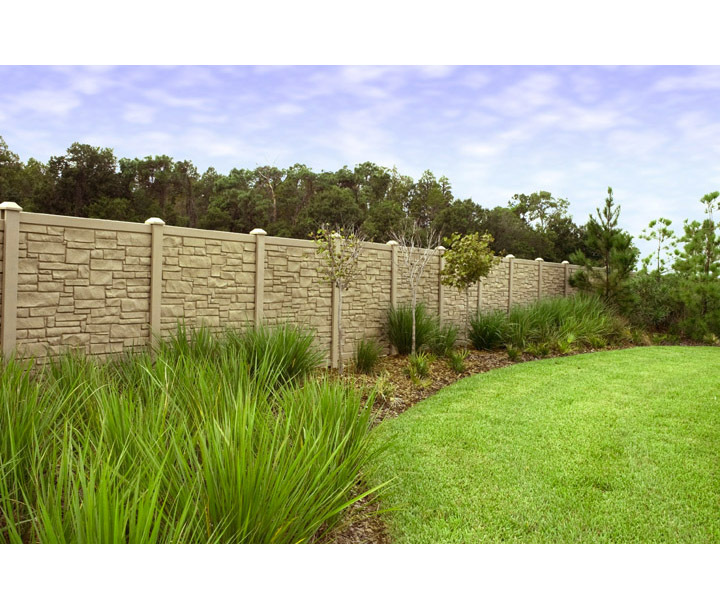 SimTek Walls are an excellent sound barrier. 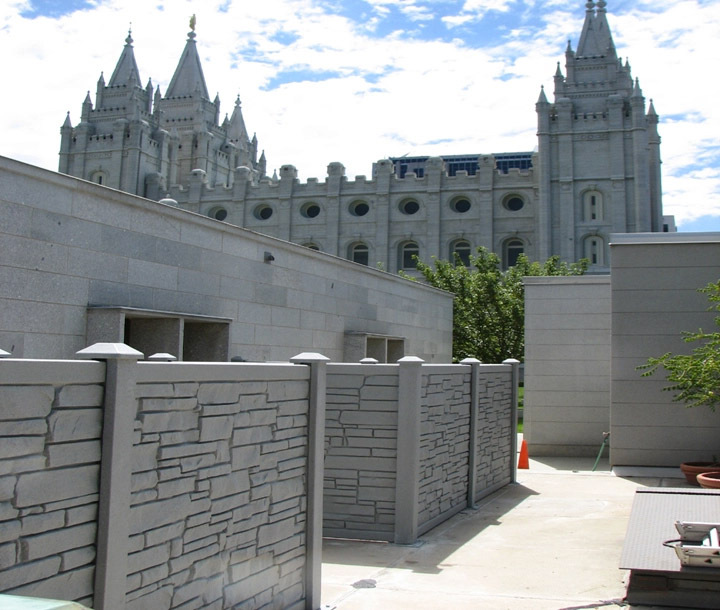 If we use a 6' concrete wall as a 100% barrier, SimTek blocks 98%, while wood blocks 75% of direct sound. SimTek is graffiti resistant. SimTek has been tested with various paints, most of which have been removed with a pressure-washer. Certain marks require common carburetor cleaner. Spray it on for two minutes, the paint softens, then pressure-washes off. What about sprinkler deposits, algae or moss, or weed-eaters? Sprinkler "rainbows" of calcium, algae and moss may stick on the surface of a SimTek wall, but will pressure-wash off. Weed-eaters do not significantly affect SimTek, it takes repeated impact, many times for a weed-eater to begin to leave a slight polish on the surface. What effect do termites, other insects or organic materials have on SimTek? Termites and other insects have no affect on a SimTek Wall. Exposure to alkaline or acidic soils has little effect on SimTek. Yes. 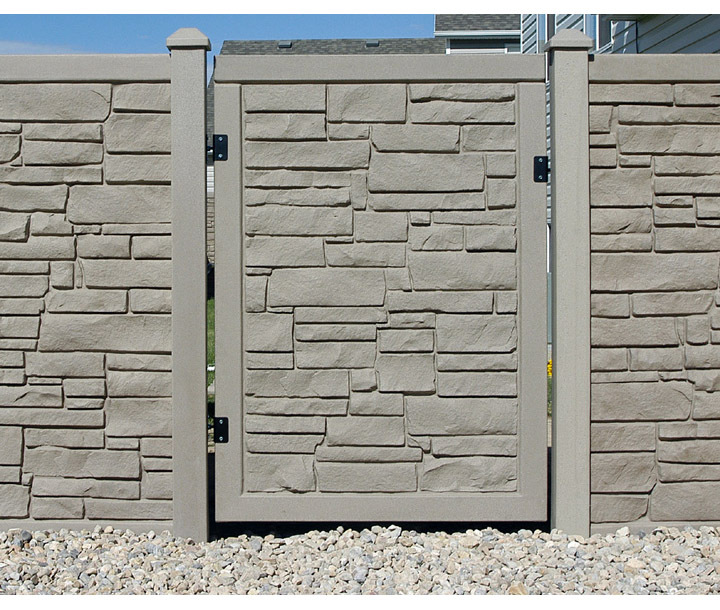 SimTek offers structurally engineered gates in 3', 4', 5' and 6' widths in 6' heights. 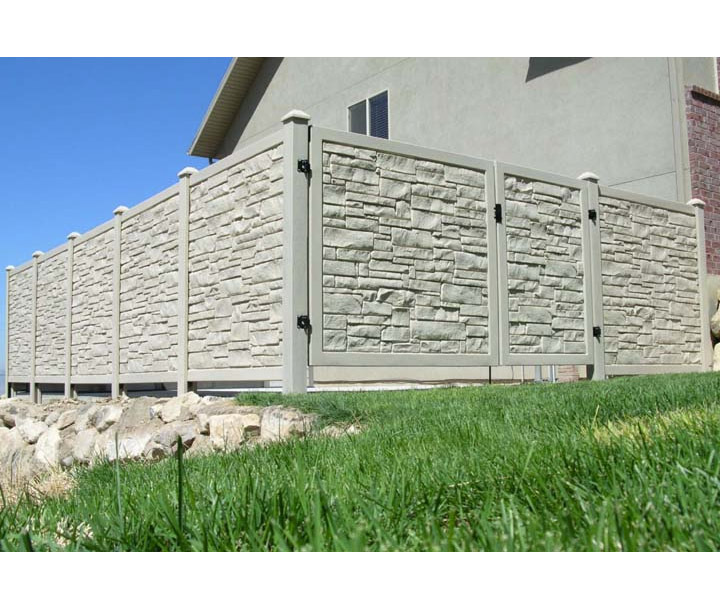 Gates may be combined to make a 6', 8', 10', or 12' gate openings. Gates for 4' and 8' heights are only available in 4' widths. They can be doubled also to make a 8' opening. 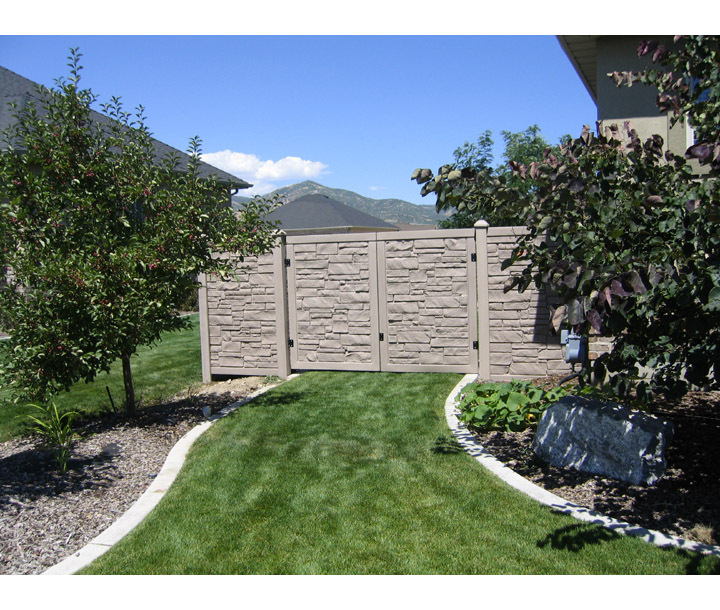 Gates have galvanized steel frames totally internalized within the molded gate. 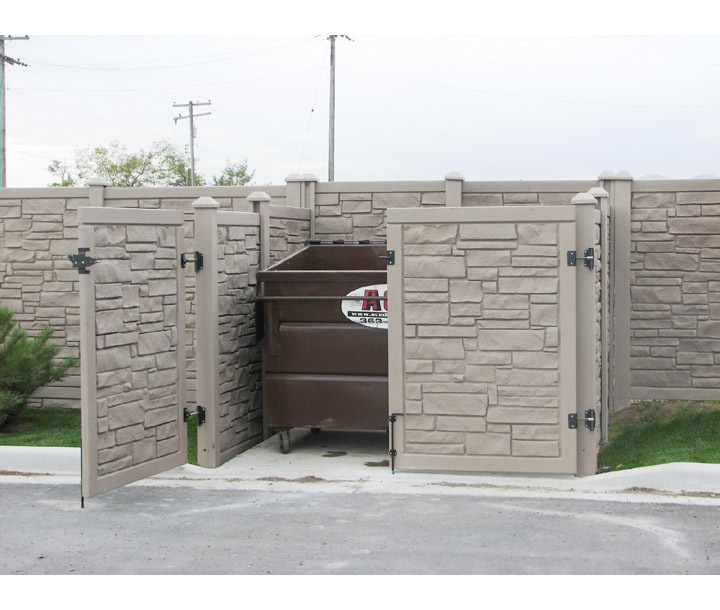 Gate structures are completely finished, only requiring the mounting of SimTek gate hardware. SimTek gate hinges are spring loaded with a self-closing design. 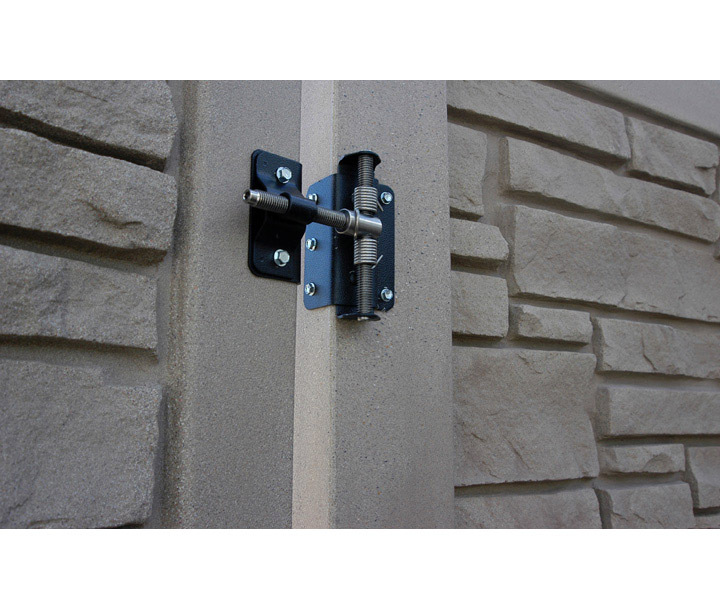 Gate latches are operable from either side of the wall. Optional drop rods retain the edge of the gate opposite the hinge side. All SimTek gate hardware is made of stainless steel with certain portions powder coat painted; all hardware is made of the fine steel and a very durable finish available. Gate hardware is attached to steel that is internal to gate posts or gates with fasteners providing good thread engagement (steel to steel). Can I adjust the gate after installation? Yes. SimTek hinge hardware is adjustable both vertically and horizontally so there is never a need to remount hardware. An Allen wrench is all that is required. Can I mount a gate from a source other than SimTek? Yes, gates provided by others have been successfully mounted on SimTek gate posts. Overall size and weight must conform to factory specs and hardware must be properly fastened to posts. 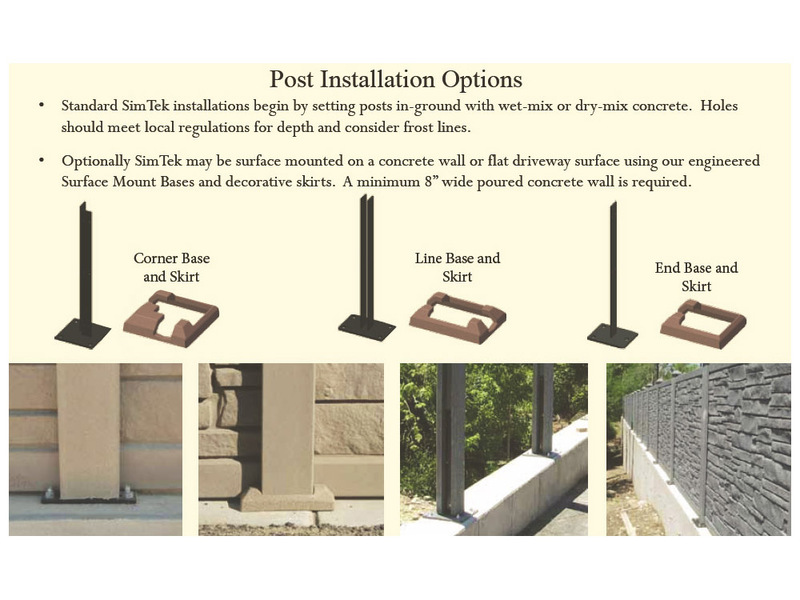 Can I mount Simtek posts and panels to a concrete surface? Yes. 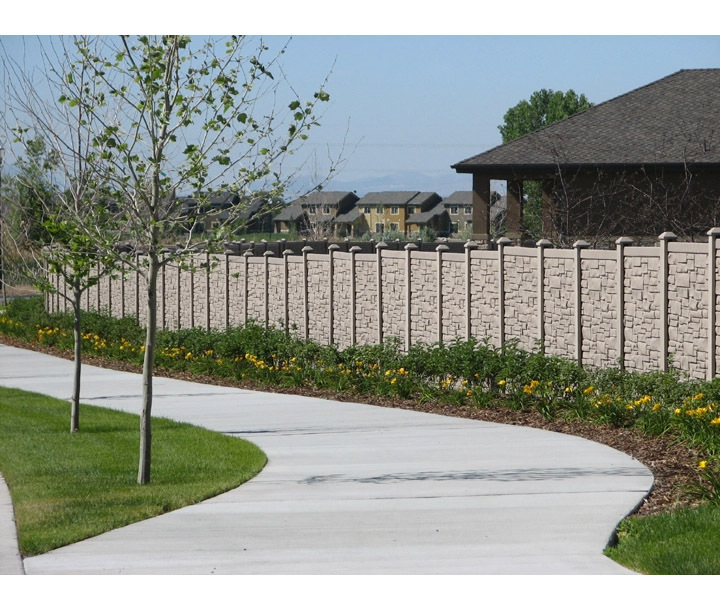 SimTek developed engineered steel "Concrete Mounting Shoe" designed to mount on either an 8" wide (minimum) concrete wall or a flat concrete surface such as a driveway. Concrete mounting shoes bolt to the posts, which must be cut off creating a flat bottom surface, and with the internal steel post structure there is excellent steel-on-steel thread engagement. Mounting shoes meet the same wind load performance standard as posts mounted in soil. There is an optional "Skirt" that is of molded polyethylene and color-matched to cover the base and fasteners of the Mounting Shoes. SimTek does not provide ornamental metal from the factory. You may purchase ornamental metal to be used with a 3' panel or in place of a 6' or 3' panel. If you will be mounting the posts in the ground, you will need to order 1 post, 1 panel, 1 cap, and 2 mounting bracket for each 6 foot section. You will also need to order 1 post for each end of a line of fence. 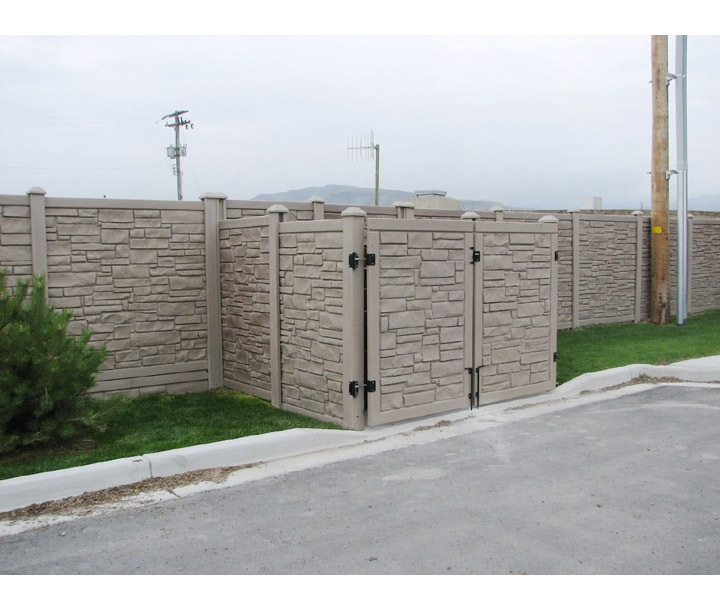 Simtek offers 4 different types of posts, line, end, corner, and gate posts. Alternatively if you are mounting on a concrete surface you will have to order 1 post, 1 panel, 1 cap, and 1 mounting shoe and skirt. What is a line post? A line post is a post that is used between 2 panels within a line of fence. SimTek Fence is set up using a tongue and groove method, a line post has two grooves in it in order to receive panels on opposite sides. A Corner Post is a Post set up to receive panels at a 90° angle. A corner post is used to create a corner in the line of fence. What is an end post? An end post is made with only 1 groove to receive a panel. An end post is used when ending a line of fence. Places where you would want to use an end post are next to a house, or a gate. What is a gate post? A gate post is a heavily steel reinforced post used when mounting a gate. Gate posts must be used in order to support a gate. What is a mounting bracket and what it if for? A mounting bracket is used to hold the fence panels inside the posts. You will need 2 mounting brackets per panel, or 2 per line post, 2 per corner post, 1 per end post and 1 per gate post. Mounting brackets are not required when mounting on concrete, the panel can sit right on the concrete, or on the optional skirt provided with the mounting brackets. When ordering a gate, you will need to order 1 gate post per gate. 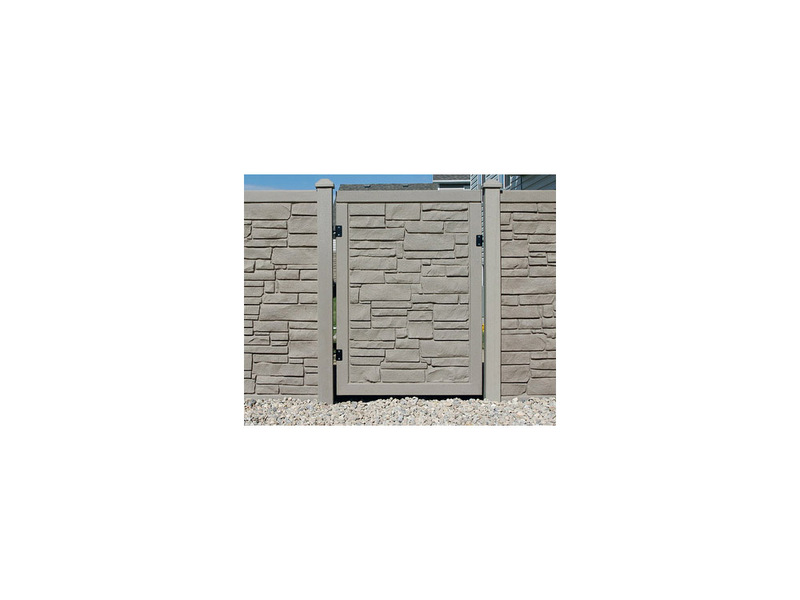 When installing a single 4' or 6' gate, an end post is used to receive the gate and to mount the latch to. All required gate hardware is included with the gate. 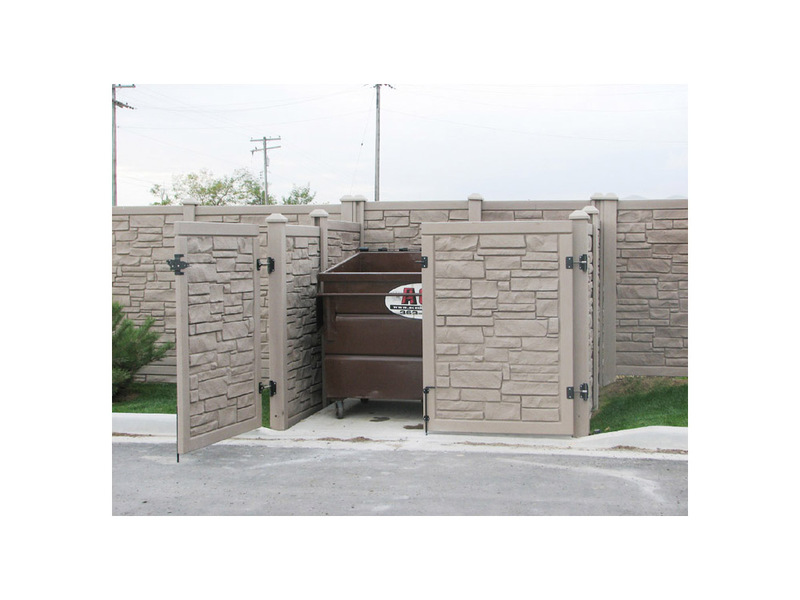 Make sure you specify if you are using a single or double gate configuration, so that you get the right hardware. Drop rods are not included in the required hardware, and must be ordered separately. How can I get more information on ordering SimTek ? If you need any help with your order, feel free to contact Hoover Fence Company for assistance. Hoover Fence recommends the Better Business Bureau as a source for installers in your area. Can I install a SimTek Wall myself? Yes. SimTek is very user-friendly to do-it-yourselfers. 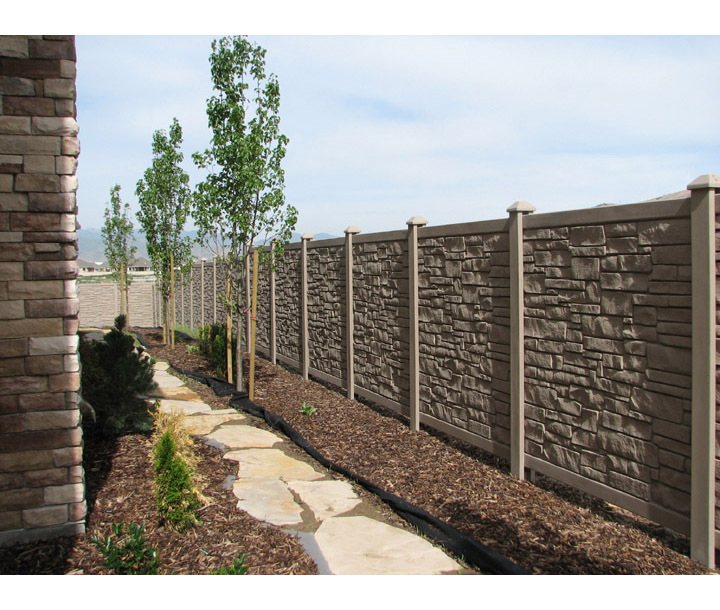 Be certain you comply with all local fencing codes, including depth below grade that posts are set in concrete. The most time consuming steps are digging holes in the ground and anchoring posts in concrete. 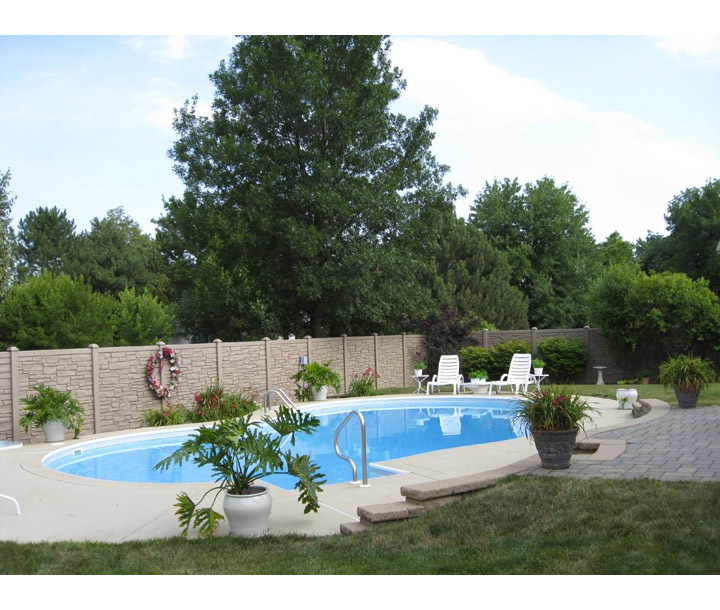 The posts and panels can be easily handled with minimal impact on your yard. See the installation instructions for more information. 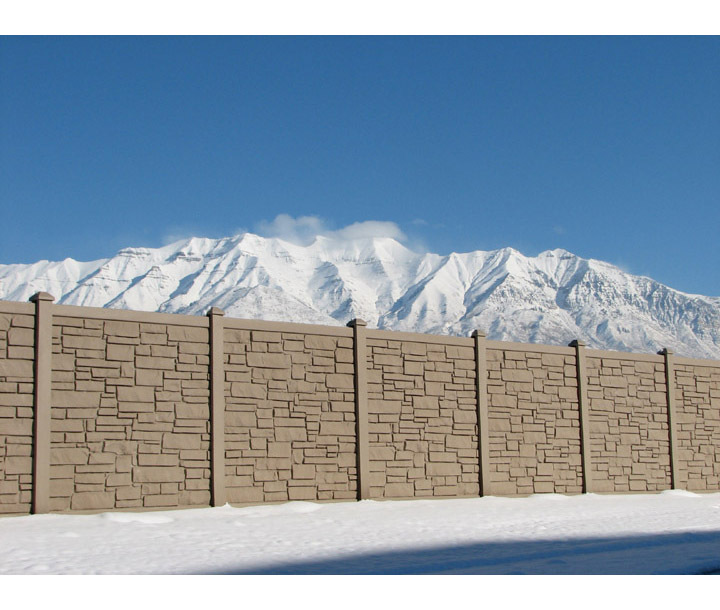 Once you have your SimTek Wall installed, please visit the warranty registration page on the SimTek website to register your SimTek Wall. What is covered by the warranty on my SimTek Rock Wall? Are there exclusions in the SimTek warranty? Yes. The Warranty will not cover damages as a result of abuse, misuse, vandalism, unauthorized repairs or modifications, defacement, neglect, accident, improper installation or improper use, etc. Installation normally is warranted by competent professional installers. 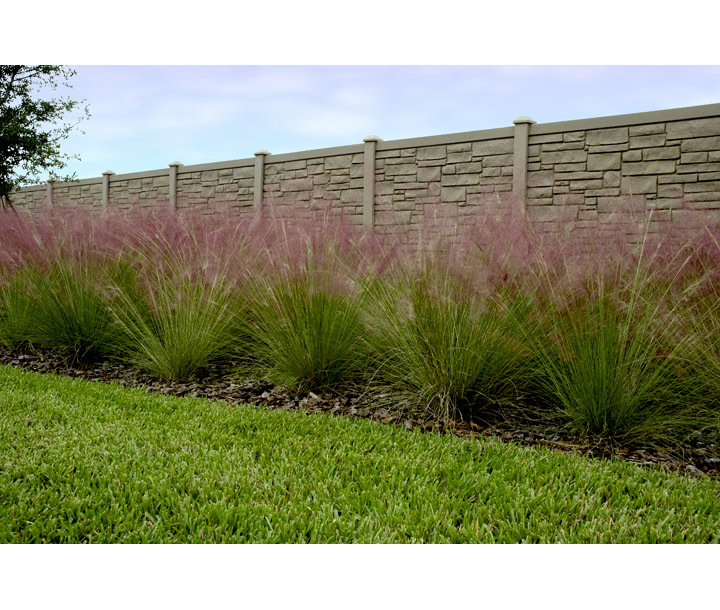 SimTek Walls normally require no maintenance. 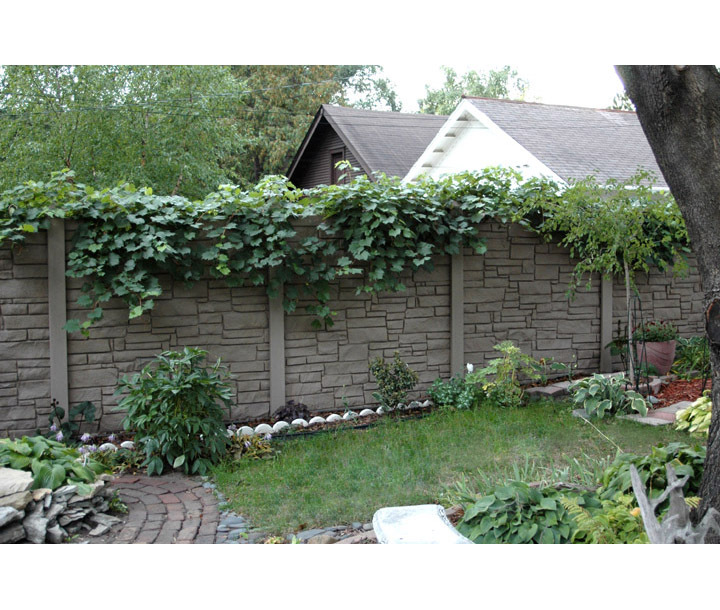 What is the long term "Life Cycle Cost" of my SimTek Decorative Wall? 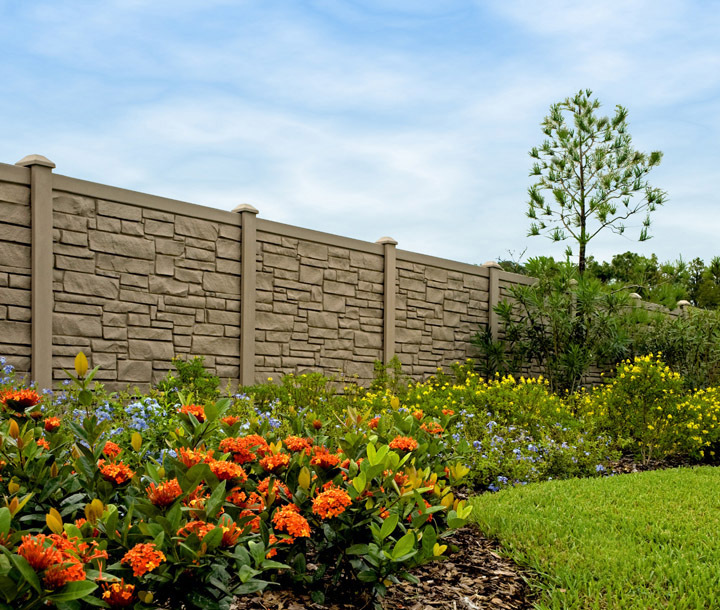 Unlike other fences and decorative walls that require ongoing maintenance and other costs, your initial investment in SimTek is all that is required. This means that over the life of your investment SimTek may be the most cost-effective product you buy. Crucial Requirement: To assure the quality of your installation matches the standard of quality of SimTek products, we recommend watching our installation video, and reading our installation instructions, prior to installing SimTek Walls. The installation videos are meant to supplement the Installation Instructions and not to be used alone. Before any installation, check all local regulations regarding fencing, location of all buried utility lines and property boundaries. Be certain that you are in compliance with all local codes, zoning laws, permits, county and state laws. 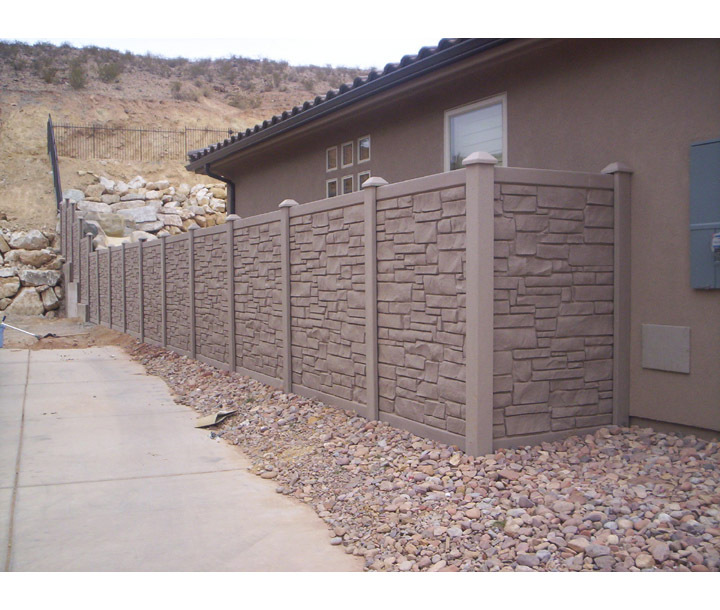 Ensure that you have all the components needed to complete your fence installation. 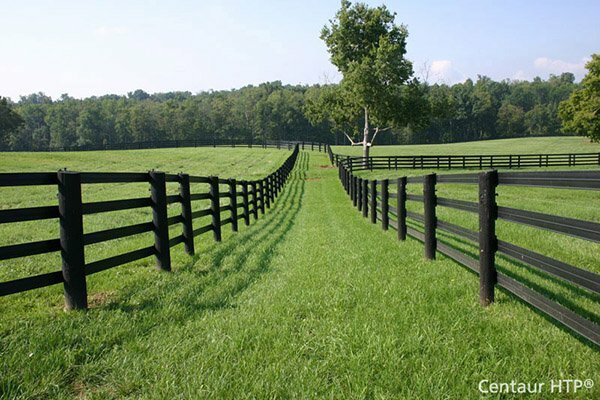 After completing your fencing project, go online and register your warranty. 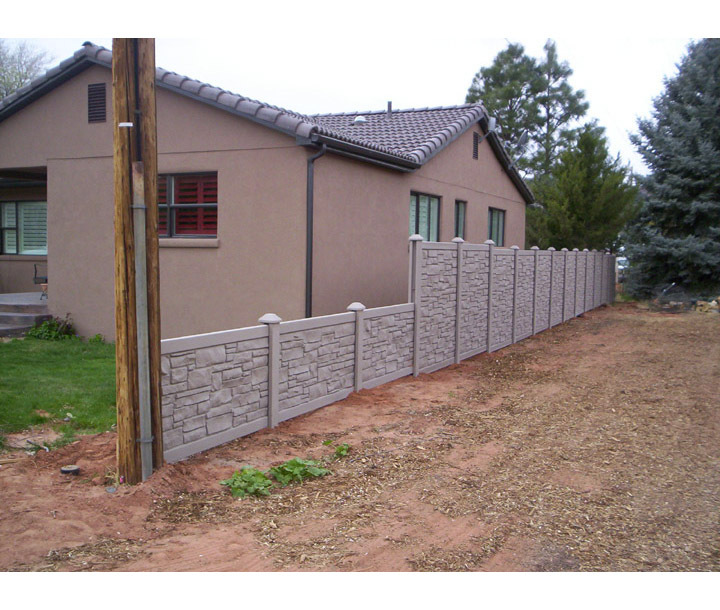 These videos shows how sturdy SimTek fence is, don't try this with other vinyl fences.